Happy mid-autumn festival! 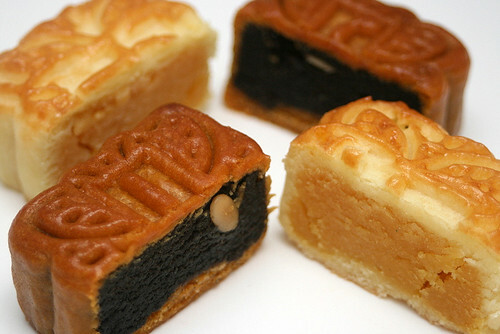 Will you be eating mooncakes tonight, perhaps with some Chinese tea? 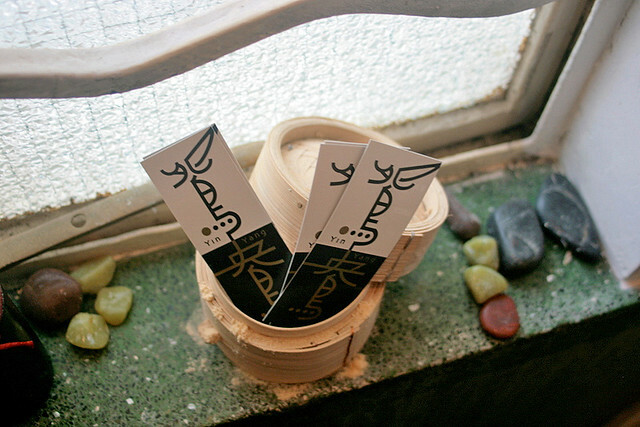 Or have you already overindulged and can't look another mooncake in the eye? Yes, we reach surfeit pretty quickly with these calorie-dense treats. But I found Fullerton Hotel's mooncakes pretty easy on the palate. These black sesame and custard mini mooncakes are perfect for those who don't like it too sweet. And even though I prefer baked mooncakes, I ended up liking their snowskin range even more. 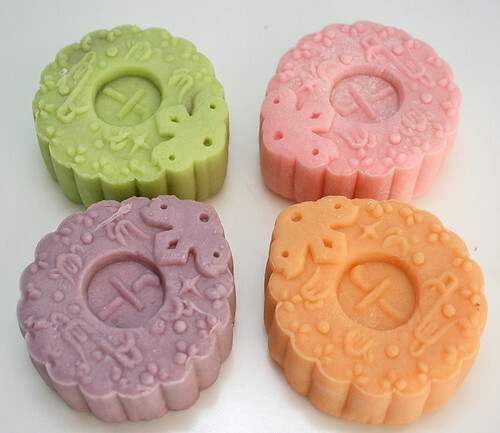 These are floral themed with unusual fillings. Such pretty pastel colours too. I was at first unsure how floral fragrances would translate to mooncakes, but these were thankfully very subtle and not overpowering. 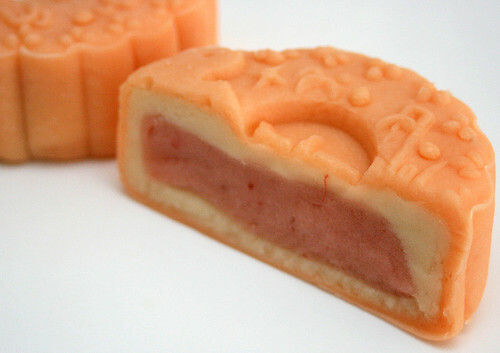 Hibiscus strawberry snowskin mooncake - you can see tiny strands of hibiscus which taste a bit like rosehip without the acidity. 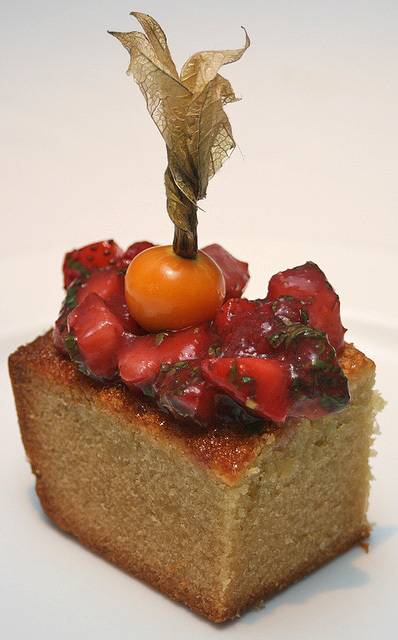 The strawberry comes across very strongly, so it's a treat for those who like the fruit. It's rather sweet though. 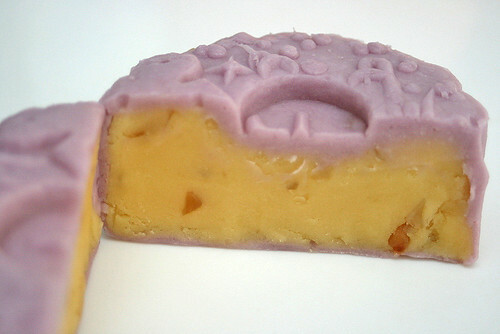 Lavender macadamia green bean - this turned out to be my favourite. The crunchy macadamia pairs well with the ultra smooth green bean paste. The flavour combination is somehow comforting. 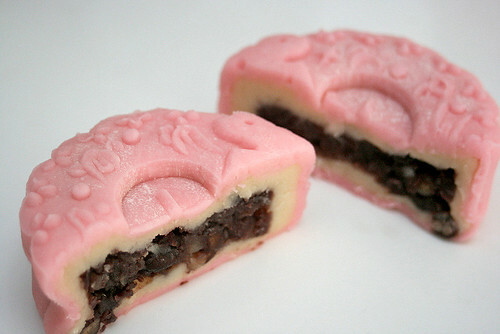 Rose red bean -well, I certainly prefer this kind of red bean compared to red bean paste. The combination didn't turn out as stellar as I thought it would be, but it's still unusual. 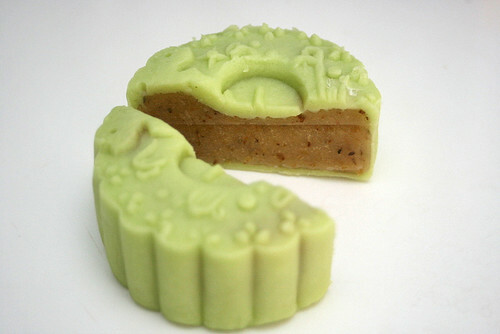 Osmanthus white lotus - my least favourite, which is surprising, because I normally adore white lotus paste. I love the colour but didn't quite take to the gritty texture. 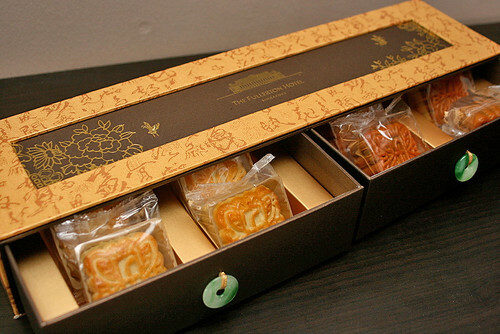 Lots of mooncake boxes are amazing this year, I hear. Fullerton Hotel's is a long rectangular set of very sturdy drawers, each with a jade pendant as drawer pull. These remind me of the old Chinese medicine chests. Very reusable indeed. They have a wider set of drawers for the baked mini mooncakes. 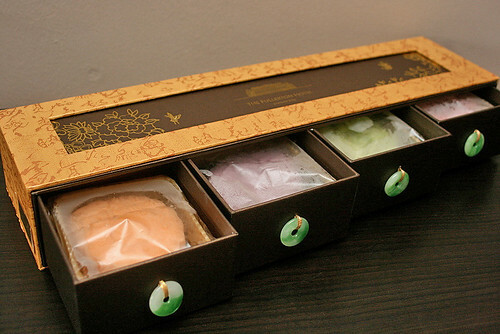 All mooncakes are individually wrapped for freshness. Thanks to Chloe Li of Fullerton Hotel for sending the mooncakes. RESULTS UPDATE: It was tough picking only two winners out of nearly 60 for this really excellent makan guide, so I am throwing in two more copies. So we have four winners! 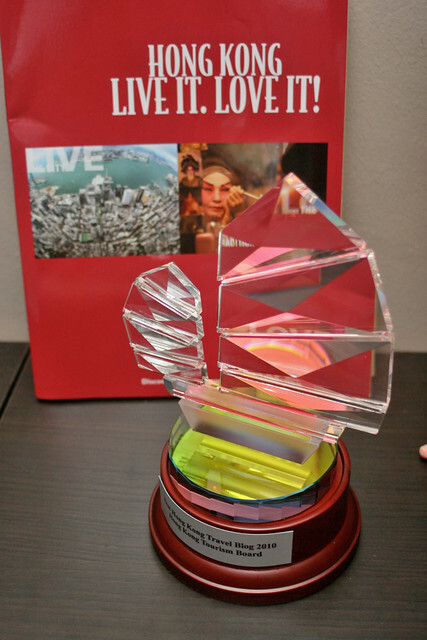 Congratulations to Rayvolez, BanBan, Xavi and Vitalism for winning the Makansutra Guide 2011! Please email me your mailing address. Thanks, everyone for joining in the fun! 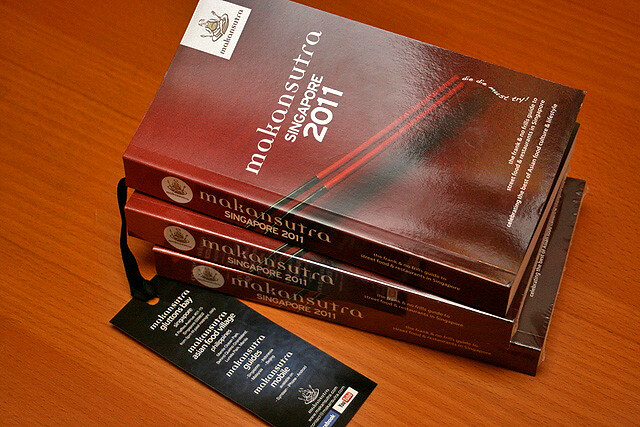 The Makansutra Singapore 2011 guide is out! 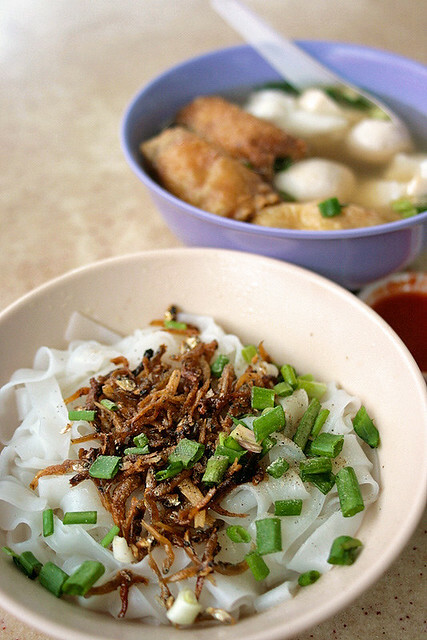 It's the best guide you can get to street food (and some restaurants) in Singapore. This new 8th edition features over 1,200 eateries including 290 brand new finds, 152 street food sections and 39 restaurants categories. It's about S$14.80 at most bookstores and some online sites. KF Seetoh kindly gave me two copies, but I'd already gotten one for myself (I couldn't wait!). So I thought it would be absolutely wonderful to do a post and give these out to readers online. Good things must share! 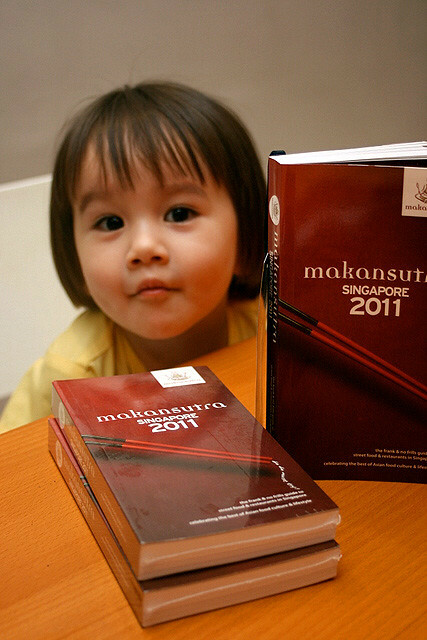 So, just leave a comment below on what you think of the Makansutra guide (you can include what you like, or what you'd like to see improved, and maybe some hidden gems of eateries you'd like to see reviewed). If you've never read it before, any comment will do, like "I want one!" I will randomly pick two winners on Sunday (19th Sept 2010) at noon. Results will be announced later that day on the blog and on Twitter. 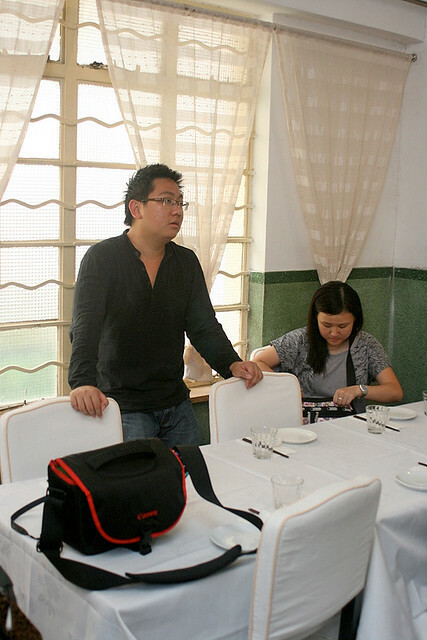 For a while, around midyear, we were wondering if 2010 would pass by without an Annual Food Bloggers meal. Thankfully, Ivan volunteered to coordinate one, and he already had in mind the perfect place and food. Michaelangelo's got a new chef who has introduced nouvelle cuisine. The menu looked good, and a nice number of us signed up. The food turned out to be excellent, and the company even better. Old friends, new faces, it didn't matter. There was plenty of laughter and merriment. But wait, yes, we were there for the food. 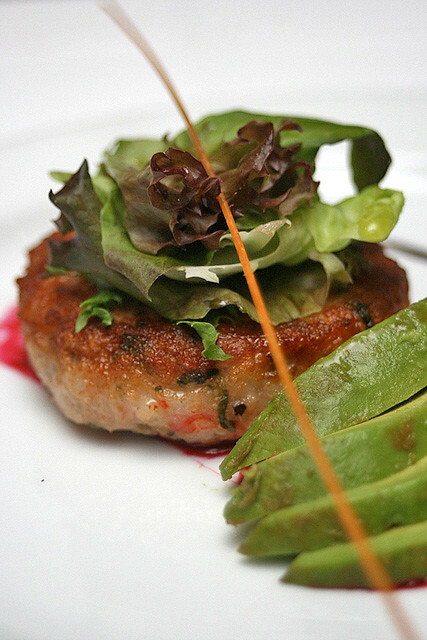 Our starter of Crabmeat Cake with Avocado topped with Mesclun Salad, Beetroot Paint & Balsamic Reduction. The chef did not stint on the good ingredients, and we could taste the sweet richness and texture of real crabmeat in this firm patty. So fresh and juicy! And seafood flavours paired with avocado is always a delight. Another dish that surprised me. "Hahaha, were you thinking canned chunks of tuna?" Ivan joked. Indeed, I was not expecting tuna tataki - what a treat! It's beautifully fresh and the pepper they use is like some super-charged species - got kick! And the sauce! I've never been fond of tomato sauces but this one had me thrilled. I think the fish broth, garlic and wine helped bring it beyond tomato's usual tangy signature. Michaelangelo's was also very generous with their starter bread (sundried tomato) and three dips (hummus, olive oil and balsamic vinegar). They kept replenishing it throughout dinner, and we relished it enthusiastically. It's the kind of bread that's very toasty warm and gently crisp on the outside, but soft, savoury and fluffy inside. And now we come to the mains - a choice of fish or veal. If I had seen photos first, I'd have gone for the fish. It also tasted phenomenally good (Momo was kind enough to share). Kind of like a fish popiah but with awesome flavours. Some thought this was a tad salty, but I didn't mind. My actual order. Being a red meat kind of person, I tend to pick meat over fish. 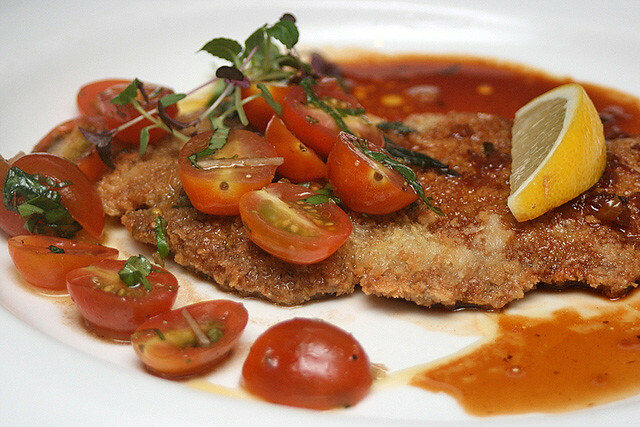 For some reason, I only saw the words "veal scallopine" and "butter" when I was reading the menu. You know how some words just arrest your attention and everything else just goes blur. I'm not sure breading and frying this was a good idea. It lent a heavy and oily taste to the already gamey meat. Some people liked this though. Somewhere in between and also after the meal, we had lucky draws with prizes kindly sponsored by Pantry Pursuits, an online shop selling kitchenware. 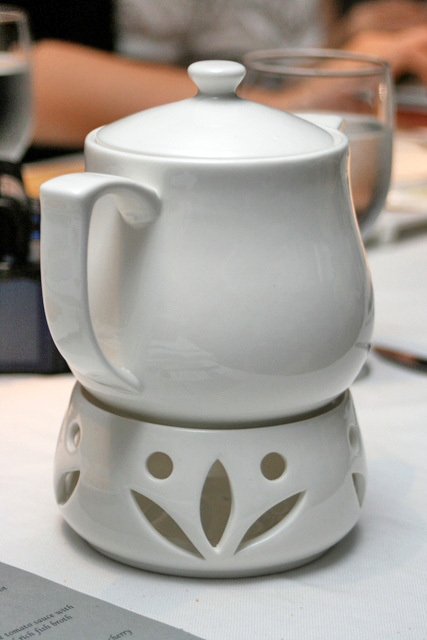 I usually never win anything, but I got a teapot with warmer. 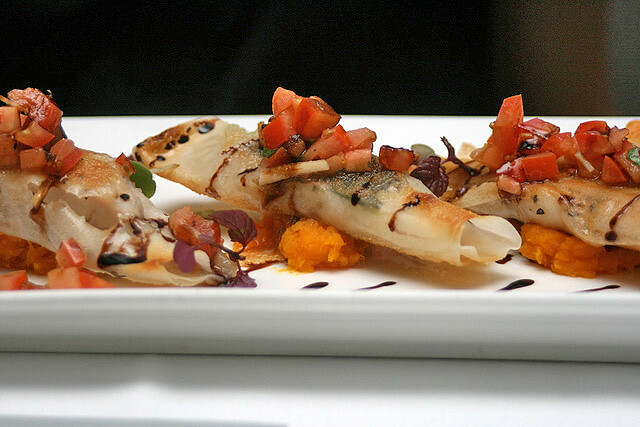 In all, some unconventional fare for an Italian restaurant, but who cares so long as it's tasty stuff, right? The dishes here are not on their regular menu, but if you'd like to try them, they welcome advance calls and requests. Check out posts also by MissTamChiak, Keropokman, Aromacookery, DirtyStall. I also had a great time chatting with Foodie-Ah (he has a gorgeous blog, go visit!). We really should have this more than once a year. Thanks, Ivan, for making this happen! Margaret Xu's signature "Yellow Earth Roast Chicken" is a must-try at her Yin Yang restaurant in Hong Kong. 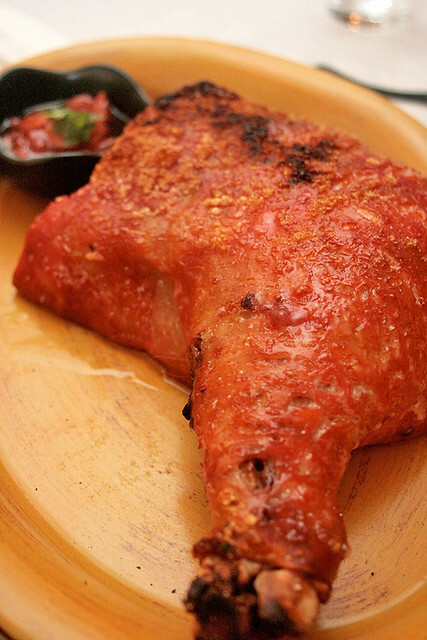 She uses a terracotta oven to achieve superbly crispy skin and evenly roasted tenderness. Update April 2015: Here's Margaret showing the steps. I have taken the liberty to transcribe the recipe. Selamat Hari Raya Aidil-Fitri! Enjoy the feasting, and time with family and friends! 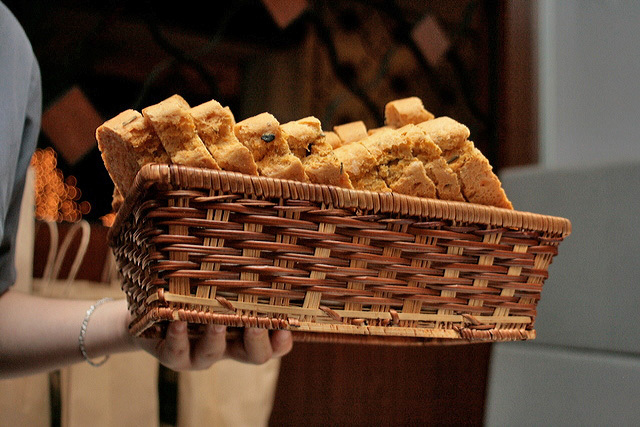 Here's a video recipe for one of my favourite snacks - rempenyek. It's spiced crispy fritters with various toppings - can be ikan bilis, peanuts or mung beans. She does go into great loving detail, and the soundtrack is a hoot. Meanwhile I think the occasion calls for some homemade cake today! I thought it would die down. It was such a non-event, a molehill inflated into a mountain over mismanaged communications. Kinda like that much smaller molehill involving a cake shop threatening to sue some blogger. Total non-event. But til today, I am still receiving media queries about this restaurant-blogger issue, and I am still seeing it being sensationalised, as though there is nothing else more newsworthy. I don't think I need to repeat what happened between Brad of Ladyironchef and Private Affairs (if you need details on what happened, you can read Xiaxue's exposé - probably one of the best out there). However, there are two disturbing elements about this incident. 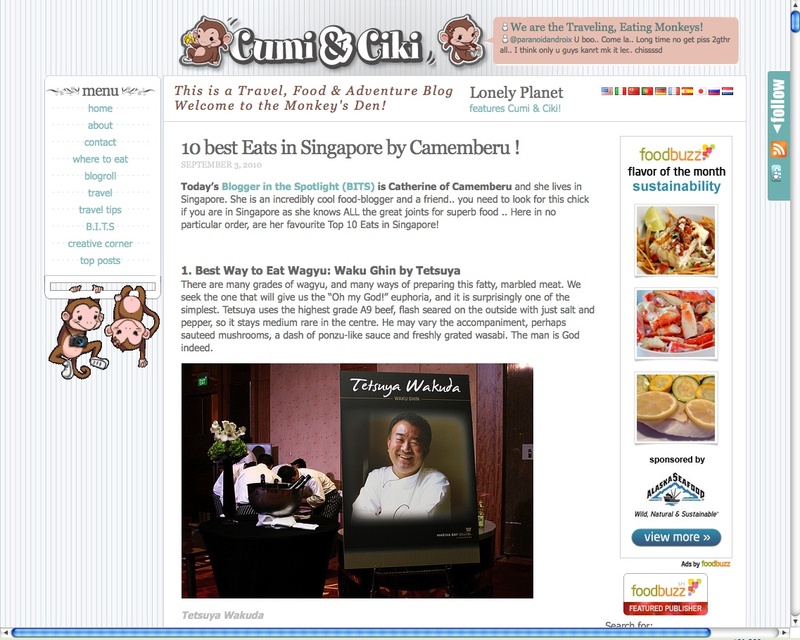 My Guest Post at CumidanCiki.com - 10 Best Eats in SG! 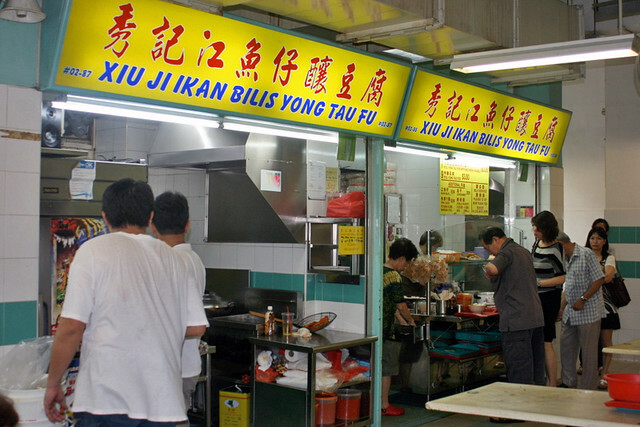 Yay, my "10 Best Eats in Singapore" post is live on CumidanCiki.com! This is the first time I've ever written a guest post, and I'm incredibly honoured to have it up on one of Malaysia's best travel and food blogs! 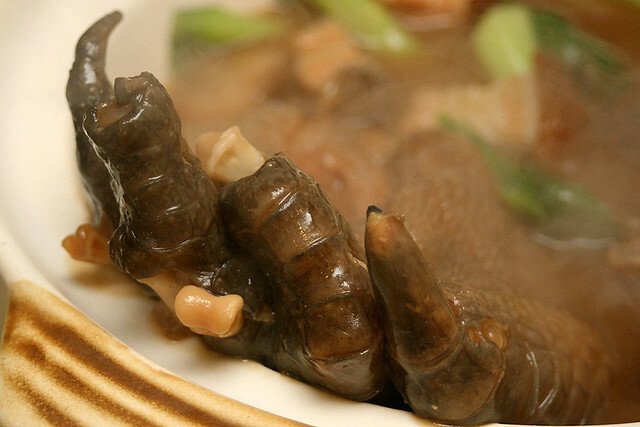 The ten eats are in fun categories, so it's a little different from your Top 10 lists. I know everyone has their own idea of what is best. So this is a casual and almost random selection of nice food in Singapore. So, please do hop on over to check out Cumi and Ciki's blog - there's lots of delicious content there from all over the world. Follow Ciki (Mei) on Twitter - @agentcikay for more goodies too! Looking forward to seeing you in Singapore next week, Mei! Singapore is a hot country, and we love our cold drinks. This is a cup of iced longan drink, one that's got goodies added to it - sweet pineapple chunks and attap seeds. Longan is also known as "mata kuching" in Malay. 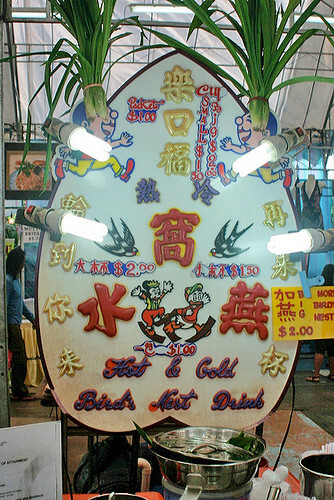 You may also have seen pineapple drinks, grass jelly, lime juice and the like sold alongside this drink. This bird's nest drink used to be very common. 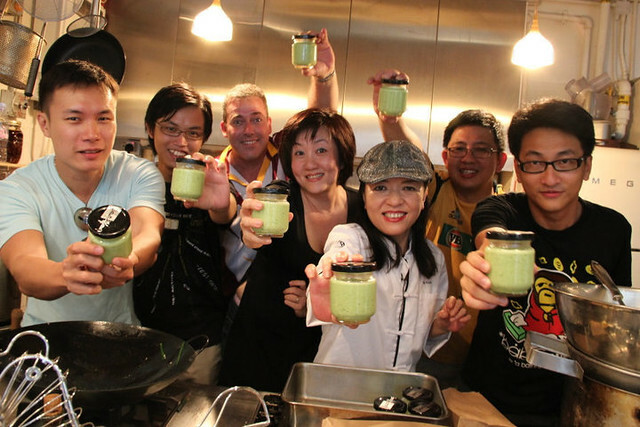 It's really just pandan-infused syrup with bits of rough-textured jelly that resembles bird's nest. But it's no less refreshing. I have a new food hero. 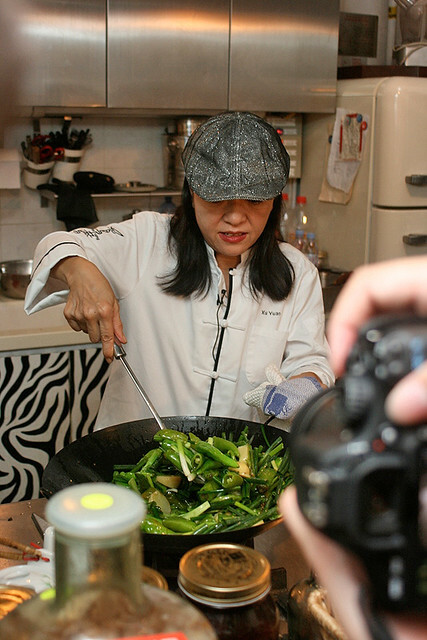 She's Margaret Xu Yuan who is possibly Hong Kong's foremost female celebrity chef, and a champion for delicious healthy eating. Margaret used to run an ad agency before becoming a self-taught cook. 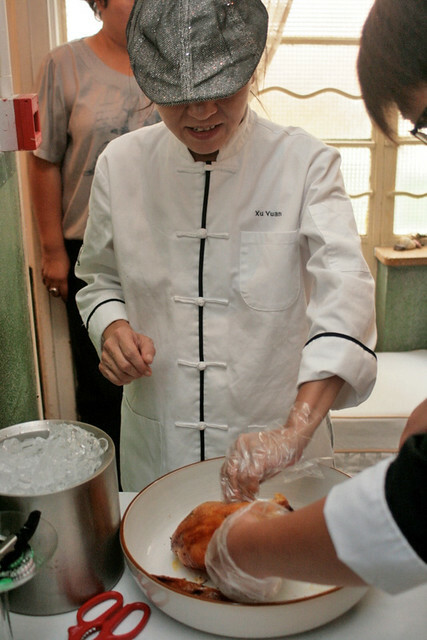 Her excursions to the villages in New Territories inspired her to rejuvenate Hong Kong cuisine. 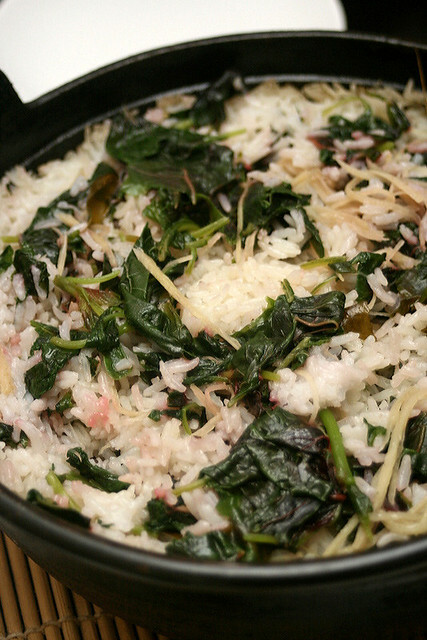 She fell in love with the stone rice grinder, as well as wood and charcoal-based cooking. 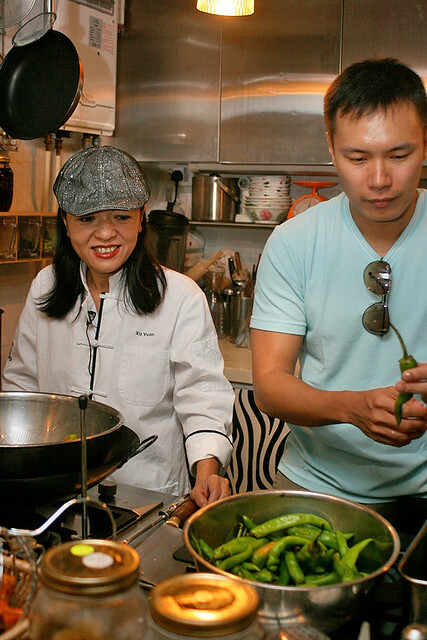 Then came Cuisine X, the one-table experiment there in 2003, using produce from her own organic farm in Yuen Long. Her roast chicken and stone-ground rice cakes became so popular, people soon needed to make reservations months ahead. Her food is very much like Hong Kong condensed in a nutshell. She combines olden techniques she learned from the various Chinese dialect/cultural groups (Hakka, Chiu Chow/Teochew, Cantonese, and boat people) with touches of British colonial influence, and presents it all with contemporary flair. I admit I had not heard of her until getting the itinerary for our trip to Hong Kong by the SBA2010 and HKTB. But I soon found out her interesting story, and how sought after she is. She now has a private kitchen (at 18 Ship Street, tel: +852 2866 0868) called Yin Yang - named after the coffee-tea drink that is so symbolic of Hong Kong. 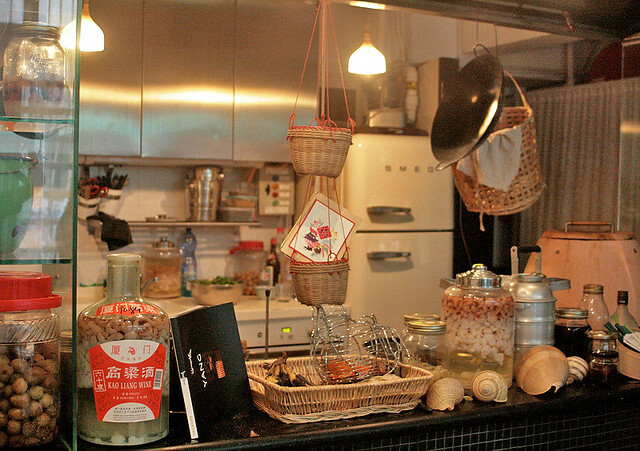 It occupies a refurbished preservation shophouse in Wanchai, and is kept deliberately small. There are only three tables, and it's all reservations-only (at least one day in advance). Here you feel more like a privileged guest invited into someone's home, rather than a customer. 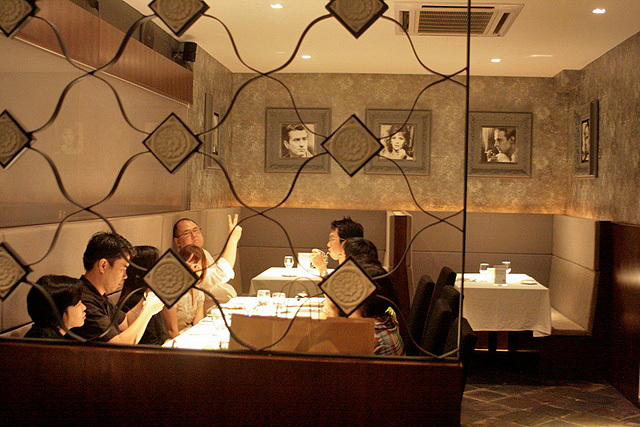 The ambiance is old school casual but very warm and nostalgic. I love the diffused light coming in from the tall frosted glass windows. There are cute little decorations on the narrow window sills. Some baskets of limes, a dim sum steamer basket of name cards, semi-precious stones and little plants. 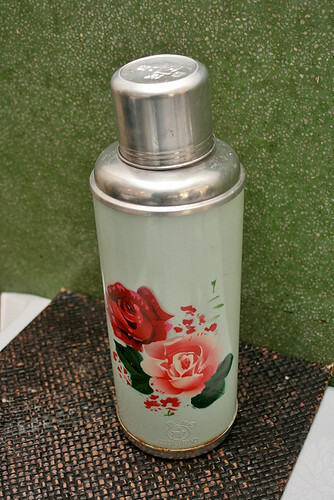 A vintage thermos flask stands at the side of the room, a symbol of homestyle hospitality. 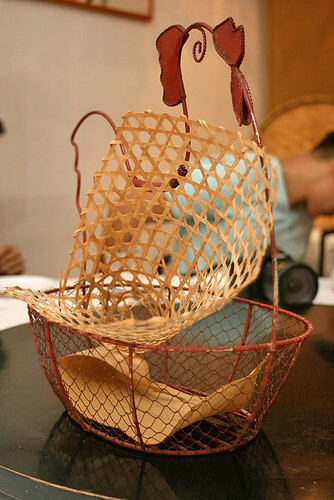 This is a cute quirky egg basket used as table decoration (and menu holder if not mistaken). We were very fortunate that Margaret agreed to host us at short notice. Normally you'd have to make reservations months ahead. She let us take the third floor tables and prepared an eight-course meal for us. Oh I found her recipe online. I really must try this at home someday, even if I don't have a terracotta oven! Margaret presiding over the shredding of the chicken. She believes doing it by hand is better than using a knife to carve the chicken. Yes, I do prefer rustic hand-torn pieces myself. 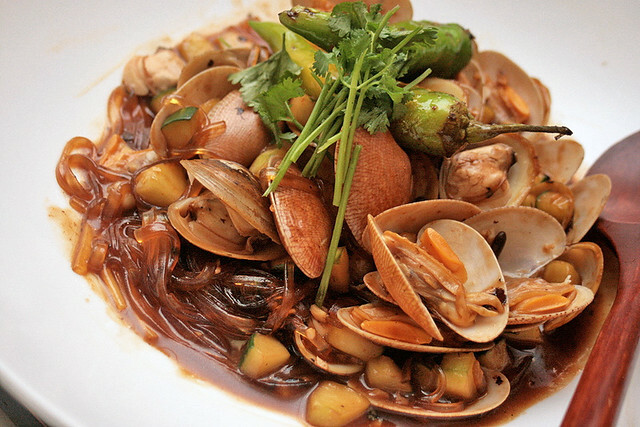 Flower clams in delicious broth with thick tanghoon. I wanted this all to myself! Gorgeous aroma and stunning flavours. 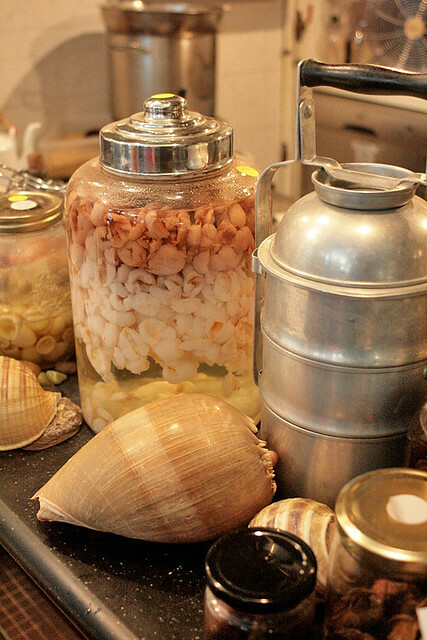 The clams were very fresh indeed. This would inspire the caveman in anyone! This is the Red Hot Baby Pig. Roast hunk of pork with bone-in! 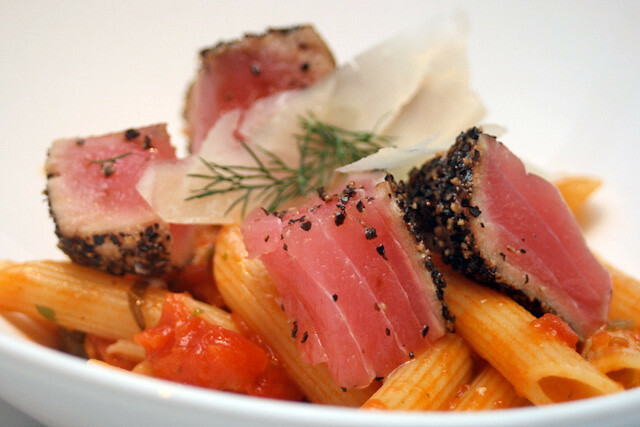 When this dish appeared, it drew gasps of delight and wonder. 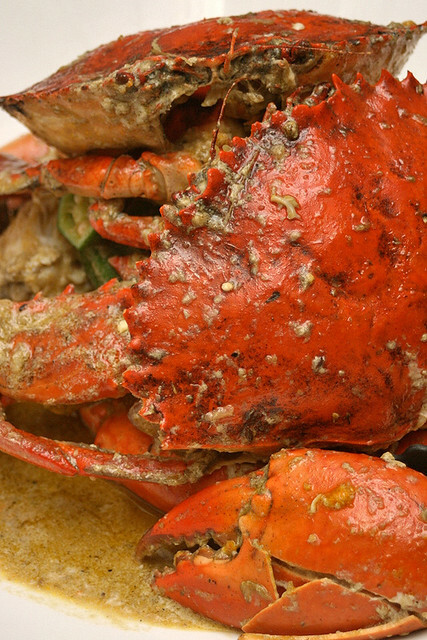 Fleshy mud crabs in a complex yet beautiful sauce with spices and coconut - a bit like green curry but much more refined. We were moaning "oh my god" as we ate. It was so, so good! Interestingly, the soup came in halfway through the courses. Seaweed eggdrop soup with okra or ladies fingers. I never thought about slicing okra this way. 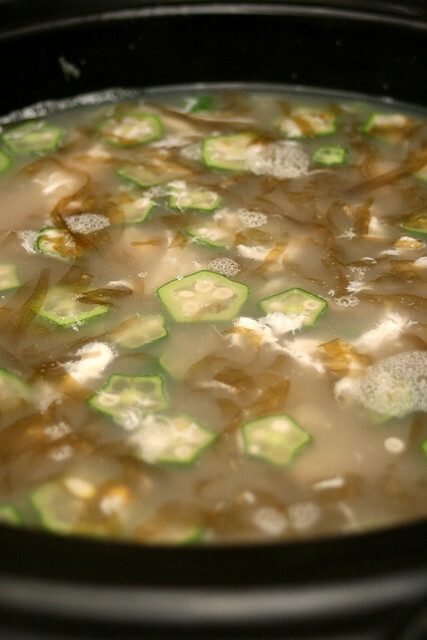 It looks like pretty little pentagonal flowers dotting the soup. There is always a carb dish in Chinese multi-course meals. To make sure you are really well-fed! The olive rice with vegetables was beautiful to look at. Like something cooked with love. Yes, your greens are important. But by the time this came along, I was too full to eat anymore. 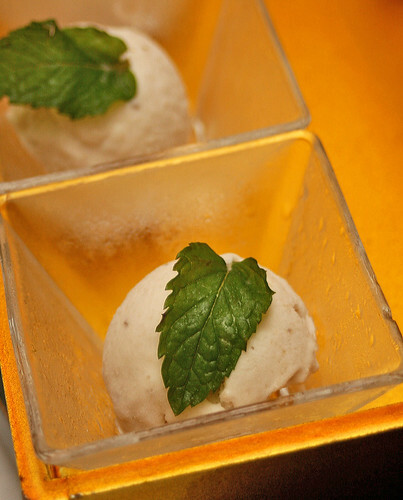 But there is always room for dessert - in our case, a scoop of banana ice cream! You can taste that it's made from real bananas, but not the overly sweet variety. We washed it all down with some refreshing beer and soft drinks. 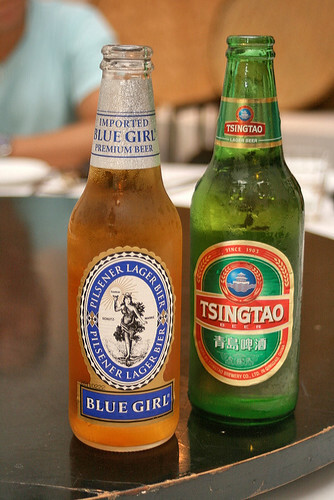 Most of us were going for Tsingtao, but some changed over to the the Blue Girl instead when they saw it, because it sounded more...risque. Her eclectic ground floor show kitchen has many eclectic pieces - modern and retro, East and West - all co-existing in style. I love the SMEG fridge! Many strange things abound in this kitchen. Margaret likes to make everything herself, so you will see foods (and wines) of all sorts in various stages of preparation. This is the terracotta oven that Margaret built herself, from two flower pots (one upturned). 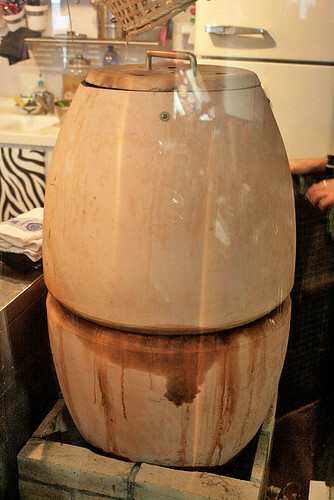 Terracotta helps distribute high heat very evenly, so the chicken she roasts in this gets crispy skin but stays juicy within. Sorry the quantities are all approximate, but the recipe is quite forgiving. I have since then made two batches (500g of chillies yield about 500ml) at home - and I can certify it's idiot-proof! The method is easy. 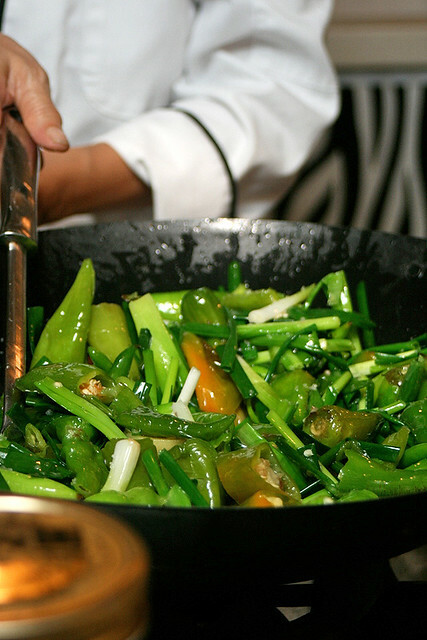 Get the oil moderately hot and fry the ingredients.The chillies go in first, followed by the ginger after a few minutes, and scallions at the very last few seconds. It doesn't take too long. How beautifully green and glistening everything is. 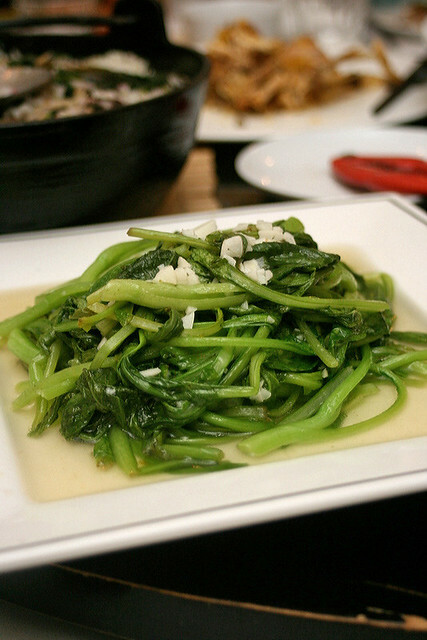 The aroma of chillies, ginger and scallions warmed our lungs. Needless to say, all these came from her organic farm up north. The Hong Kong chillies don't carry as much heat (although Margaret says you can never tell when you'll get a rogue pod that's superhot). 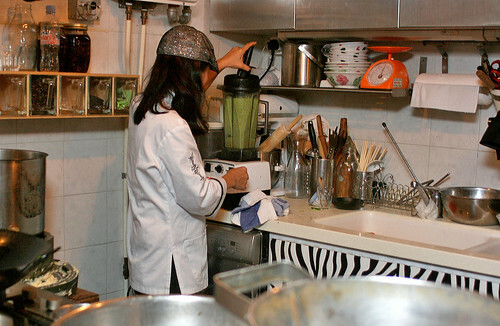 Margaret then gave it all a good whizz - oil included - in her industrial strength blender. It came out looking interestingly light green! She poured some out for us to have a taste. Oh my, how could so few ingredients taste so good together? Just heat oil, fry and blend! Voila! We were lapping this sample bowl all up! Could not stop spooning the creamy stuff into our mouths! 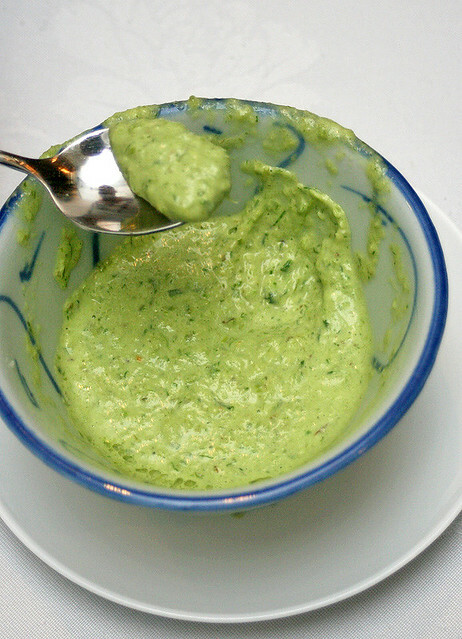 This would be great as a dip for chicken or seafood. 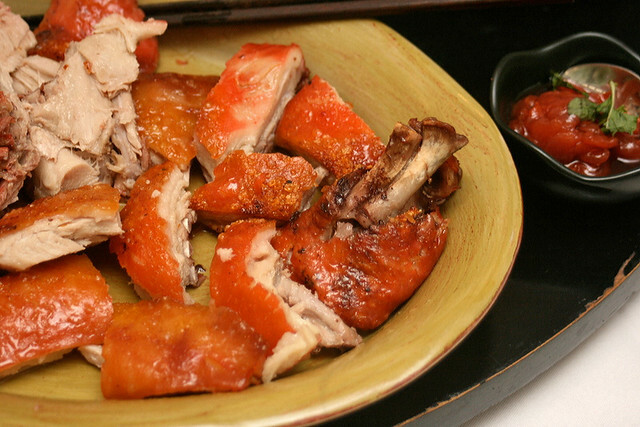 I even think it's perfect with our chicken rice, or simply with bread or prata or nachos. Fortunately, we each got a bottle to take home too! Hurray! 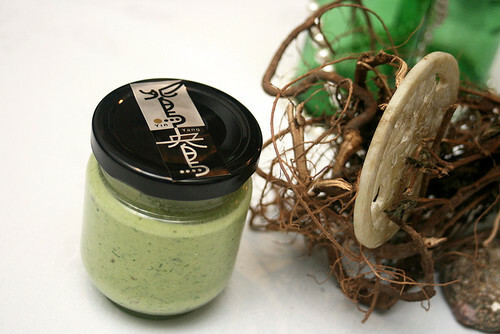 We happily christened this the "Green Dream" - nice, right? 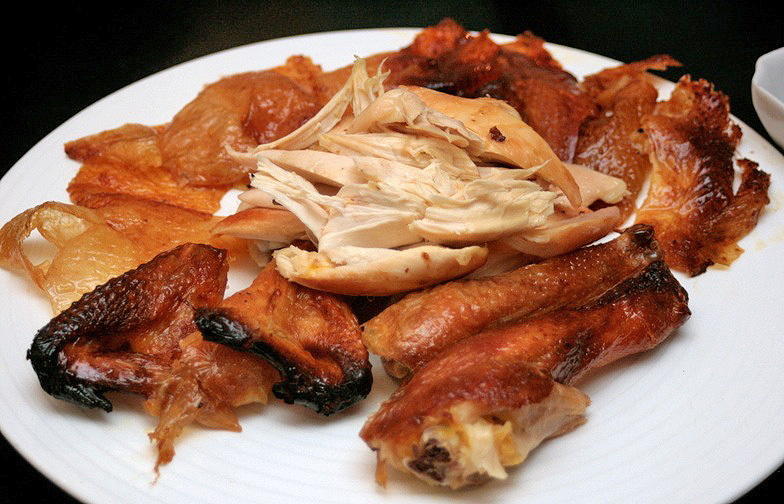 This was our last meal in Hong Kong, and one of our most memorable. I count myself very lucky to have had the chance to dine at Yin Yang, and to learn from Margaret (I really do hope she gets an English cookbook out soon, she has one in Cantonese). 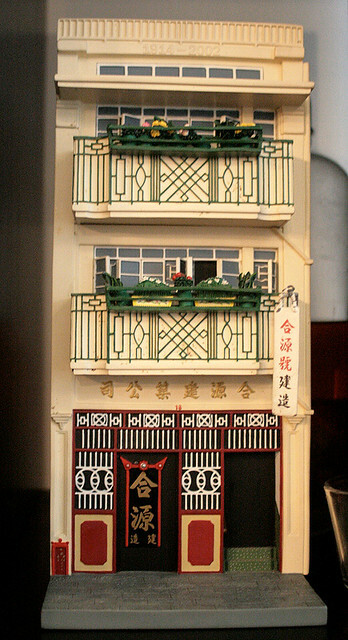 I'm pleased to make this fabulous stop my final post of the Hong Kong series (sixteen posts in total). I hope you guys have enjoyed trotting around with me vicariously. I'd really like to thank OMY and HKTB for making this four-day trip possible, and for showing us incredible experiences and gastronomical delights in Hong Kong. You can still view posts (more coming!) on the OMY joint travel blog - catch the different perspectives from the ten bloggers who went on the trip.